When a team announces it’s formed a new partnership with a paint company or software corporation it’s difficult to share in their excitement, but champagne houses… We’ll toast to that. Dom Perignon have kicked off their partnership with Williams to celebrate the British team’s 600th GP, while down at Ferrari they’re sipping Veuve Clicquot and in the Paddock Club everyone’s quaffing Mumm, not just the lucky three on the podium. Motor racing’s champagne soaked celebrations weren’t forged overnight. F1-SD gives you the key dates that shaped the modern Formula One curtain call. George Washington Vanderbilt III – American yachtsman and scientific explorer – resurrected his uncle’s famous race, the Vanderbilt Cup. Run at the new Roosevelt Raceway on Long Island, Tazio Nuvolari climbed from his winning Alfa Romeo and stepped up onto the podium to receive his laurel wreath and a trophy taller than himself. But he received another gift too – a chilled bottle of Moet & Chandon. 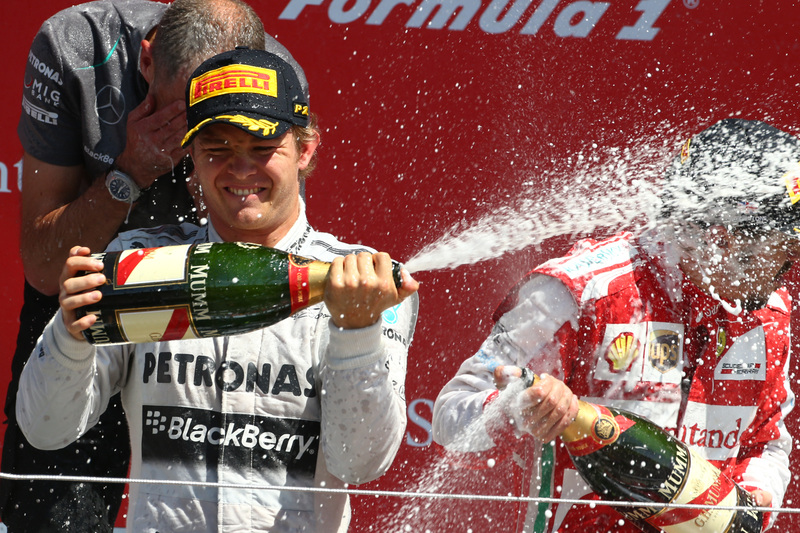 It was the first time that champagne had appeared on the podium. Mr Vanderbilt was great friends with Monsieur Ladoucette, Moet’s US agent. “Come to the race”, said Vanderbilt, “and bring some cases of your fizzy drink. I’m sure the drivers will need some refreshment”. Before this date, drivers had been more partial to a nip of brandy with a cigar. It was the sixth round of the very first Formula One World Championship season, and F1 had come to Champagne. The wine growing families from the region all gathered at the Reims-Gueux circuit, eager to meet the drivers. The throng of VIPs, with names like Lanson, Mumm and Pommery, were hugely hospitable on their home turf, awarding grateful drivers cases of their produce. Monsieur Chandon held a large banquet at his chateau that evening, as did several of the other families, and drivers like Fangio were honoured to accept the invitations. It was there that lasting friendships were born, and a commitment to drink a certain label. And thereafter, Champagne always featured in the post-race celebrations, except for in Germany – the Nurburgring was owned by the Prince of Metternich, who insisted the drivers quaff only his eponymous Seck sparkling wine. It was a particularly hot day, and when winners Dan Gurney and AJ Foyt mounted the podium, the magnums of champagne at the rear of the stage had been sat in the sun for over half an hour. The wire cages had been removed from the corks already. As the silverware was being presented, one of the corks shot in the air with a bang, and the champagne spilled forth, showering the podium party. Gurney, in an attempt to shield his boss, Henry Ford II, tried in vain to stop the flow by putting his hand over the top of the bottle – as a result, everyone got drenched with bubbly and a legend was born. Gurney, incidentally, autographed and gave the bottle to LIFE magazine photographer Flip Schulke, who used it as a lamp for many years. Schulke, who was acclaimed for his reportage photographs of the civil rights movement, died in 2008. Now the bottle has been returned to Dan Gurney. Back in the 1960s and 70s, the champagne houses would offer up bonus prizes to the drivers: win pole position, and you and your significant other could win a weekend in Epernay and your weight in champagne. Bank the fastest lap of the race, and you would find 100 chilled bottles of the good stuff waiting for you in your hotel suite. Back in the early 1970s, Moet & Chandon signed its first official supply deal with the Automobile Club de Monaco. But the agreement extended beyond podium refreshment – because there was no hospital in Monaco back then, Moet stationed its Falcon 10 company jet in Nice ready to provide a medical shuttle up to Paris if needed.